SKU: BBFS. 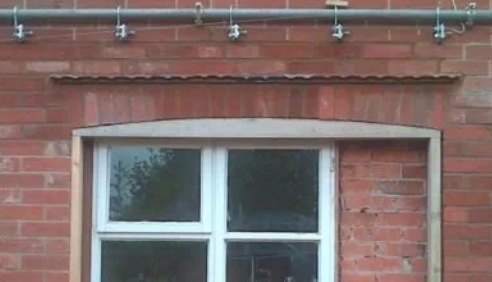 Category: Brick Brace. 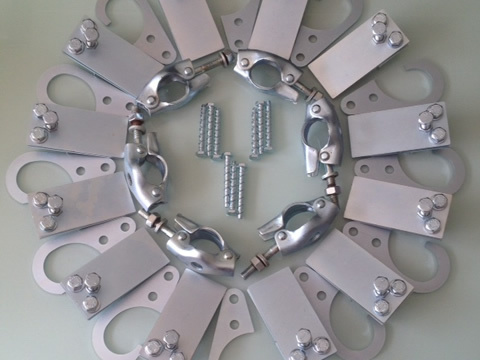 12 safety tools, 12 hooks, 6 couplers, anchor bolts, free delivery, full instructions and a correct procedure. 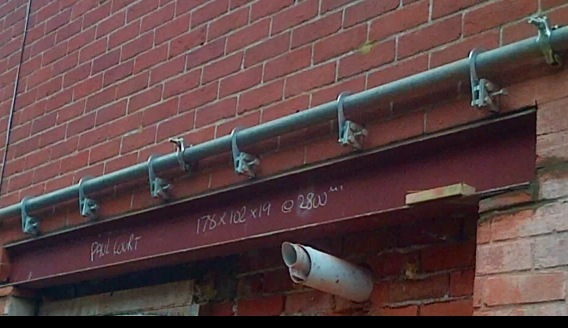 Create openings up to 3150mm, approx 14 brick lengths wide with no Acrow props at any height, high or low. 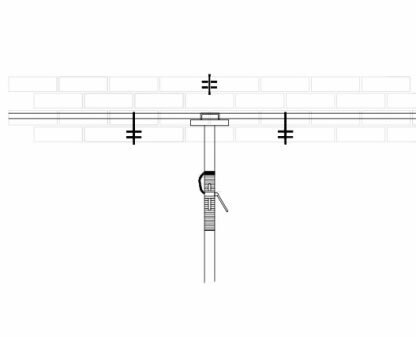 The Brick Brace safety system allows openings up to 4,500mm (20 brick lengths) when using only one Acrow prop fitted central when clipped to the horizontal scaffold tube. Use as a safety belt above openings when propping or needling to hold the brickwork in-between props and to help reduce the risk of collapse through overloading. Support masonry as one whole piece rather than as individual bricks in the case of only propping especially within lime mortar masonry! 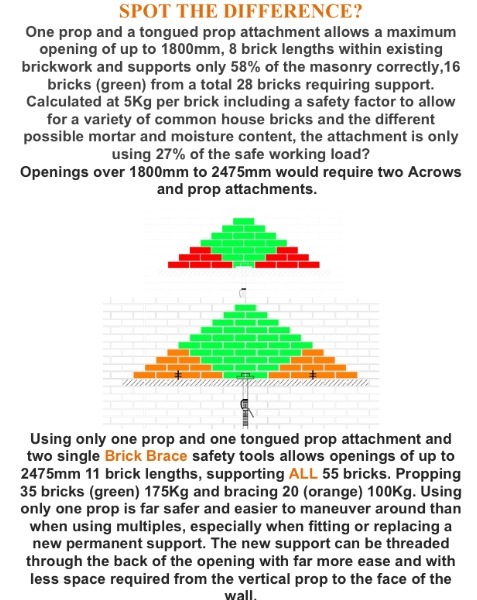 Fitted 3 bricks apart in a cement mortar mix, a maximum of 2.5 bricks apart within a lime or weak mortar mix and within every perpendicular joint within block work. 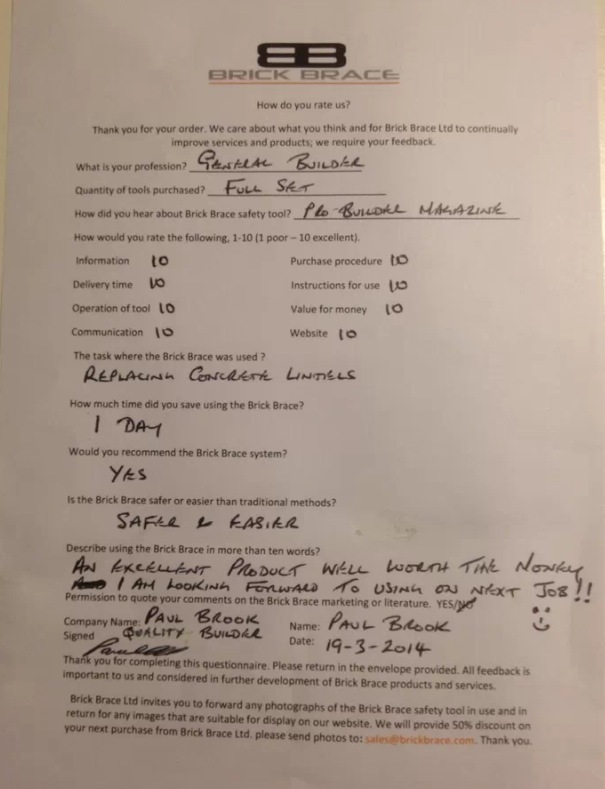 Pre-stress masonry with the Brick Brace prior to alterations and support 100% of the masonry above the opening, gain further fitting space, reduce repair time and achieve a guaranteed superior and safer finish. 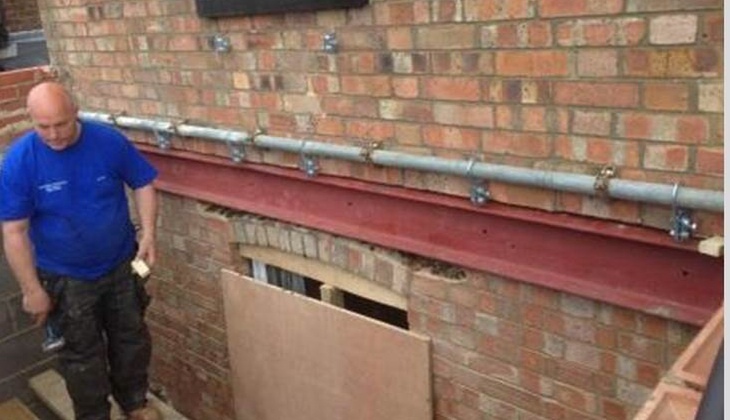 It’s not possible for a Strongboy or any similar designed product to give the correct fitting work access for every task without dangerously overloading itself, further equipment should also be used which is why we created the non intrusive Brick Brace Safety Tool and Safety System. We do not endorse the misuse of any temporary support equipment but anyone that continues to overload Strongboy’s through over extending from the wall we highly recommend bracing the masonry beforehand to increase the unknown safe working load and to reduce the risk of minor and major collapse, especially within lime mortar masonry. 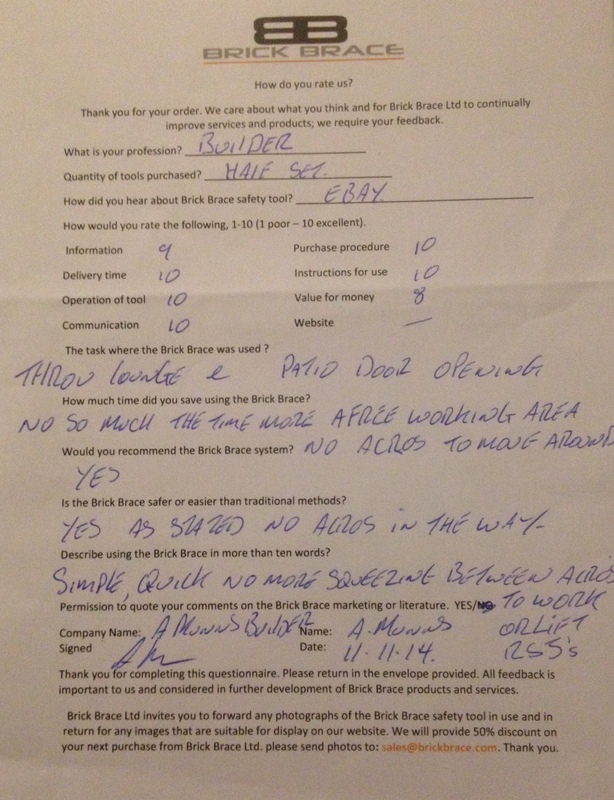 What does the Brick Brace do? The stability & strength of masonry is unknown and varies upon every task and is dependent on the mortar mix and the age of the masonry. 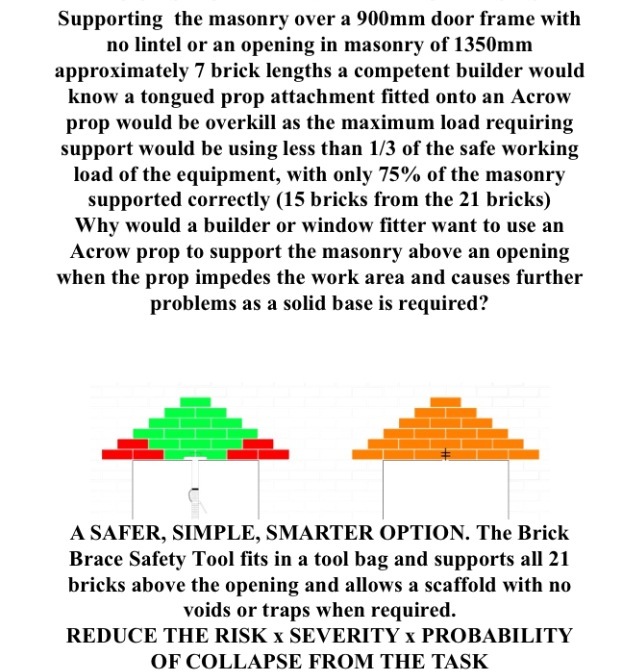 The fully tested Brick Brace safety tool increases the unknown variable strength of masonry to 40Nm which through tests is strong enough to prevent minor and major collapse during alterations. 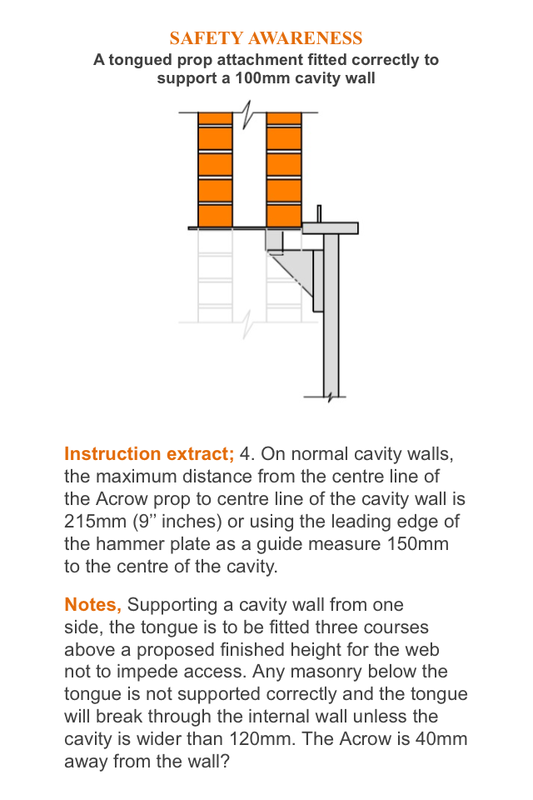 Please view our 2019 propping guide for further information! 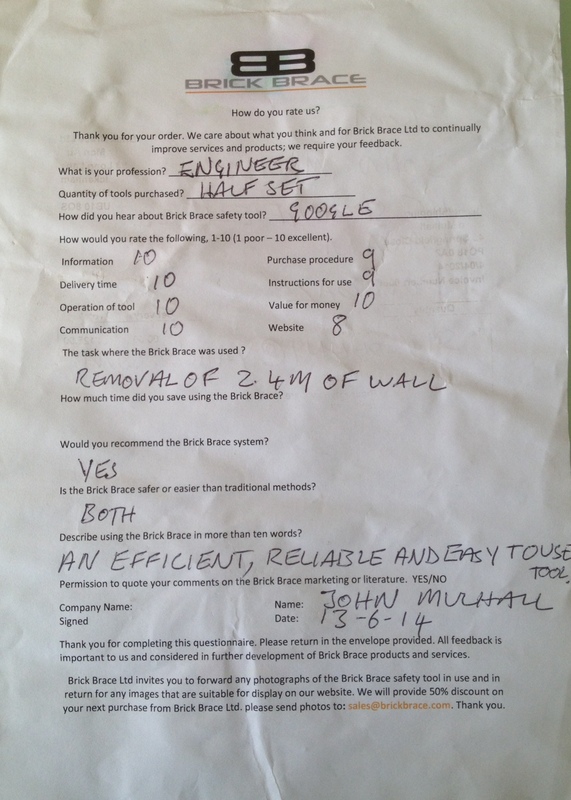 Share the post "Brick Brace – Full Set"